Saw this 3 wheel bike yesterday stopping beside the car I was in. Quickly took a photo of it with my iPhone. It's the Cam Am Spyder! I did an online search and realise it has been in Singapore since mid 2009! 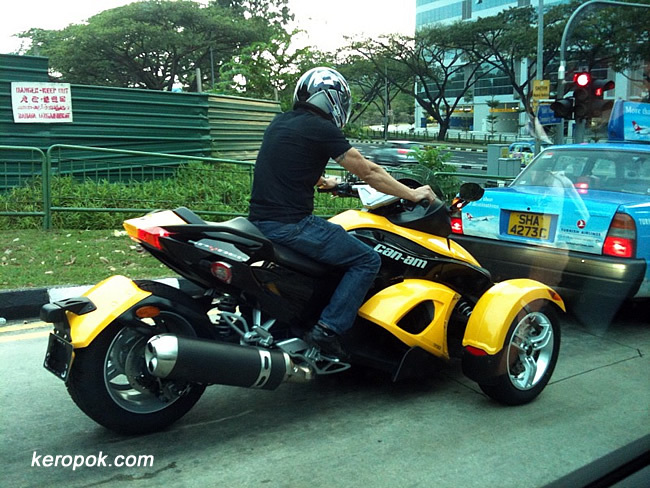 Retailing around $36K, and classified as a motorcycle by the Land Transport Authority (LTA). Blanked the bike's number which happens to be a very very nice number too! I am sure my dad would love it. Right dad? Labels: Motorcycles, Seen on the streets. It looks more comfortable than the taxi in front eh? this 3-wheeler makes it neither here nor there - doesn't have the agility of a 2-wheeler yet seemingly cumbersome to steer. but the video i googled shows it is very easy to drive/ride. Maybe it's a promotional video. hehe..
Irene Ang / Mrs Rosie Phua of PCK Pte Ltd. I want to be taller?